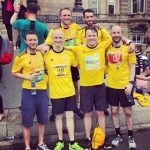 Six members of the GBA football team took part in the Men’s 10k in Glasgow on Sunday 17 June 2018. Graeme Brown, Andy Philips, Joe Stewart, George Stevenson and Paul Mullen all trailed Craig Dewar round the city centre course. Craig completed the race in an impressive time of just over 41 minutes. The race raised money for Cancer Research UK and it is hoped that more of the team members will sign up for the next 10k scheduled for November in Edinburgh.